The New York Red Bulls played to a 1-1 draw against Sporting Kansas City on Wednesday evening at the Kino Sports Complex in a preseason match in Tucson, Arizona behind a goal from Bradley Wright-Phillips. With the first leg of the Scotiabank CONCACAF Champions League Round of 16 series against CD Olimpia just over a week away, Jesse Marsch pushed his starting group to a full 90 minutes, aside from midfielder Marc Rzatkowski, who played 75 minutes before being replaced by academy product Amando Moreno. Midfield regular Felipe was not with the team on Wednesday. Felipe departed camp on Tuesday to be at home for the birth of his second child. 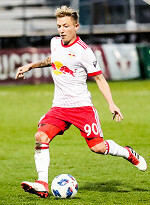 Rzatkowski saw his first extended game action after joining New York on loan from Red Bull Salzburg in January. Wright-Phillips' goal came off of a broken play after a first-half corner kick. The ball fell for the Red Bulls striker and he was able to find the back of the net from outside the six-yard box.